Lyle died Saturday at his home on Chicago's South Side, his wife, Eunice, said Monday. She added that Lyle had been battling prostate cancer. The members of the nation's first black fighter squadron won acclaim for their aerial prowess and bravery, despite a military that imposed segregation on its African-American recruits while respecting the rights of German prisoners. "We flew 500 feet above the bombers to keep enemy fighters from hitting our guys," he recalled in a 2012 interview with Jet magazine. "I loved flying, being up in the clouds, the scenery. I flew 26 combat missions, from southern Italy to Austria and southern Germany, over the Austrian Alps." "I watched bombers being torn apart, but they were performing the mission they signed up to do," Lyle said. "And when I had to shoot the guy who was shooting at the planes I was protecting, I did not feel bad because that was my assignment." "He had no fear," Eunice Lyle told the Chicago Sun-Times . "None at all." 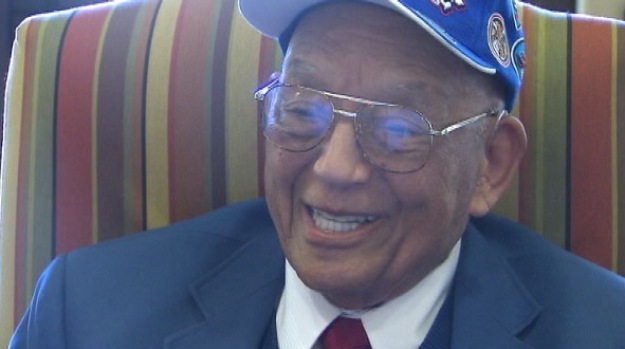 The Tuskegee Airmen made history 70 years ago as the first African Americans to fly combat during World War II. One of the few surviving members of the Airmen met with World War II B-17 pilots at the Valencia Terrace Senior Living Center in Corona Tuesday. Tony Shin reports from Corona for the NBC4 News at 5 p.m. on May 14, 2013. "He was an amazing sailor," said Janet Hansen of the Jackson Park Yacht Club. "He could sail his boat in any weather."